I didn't intend to post two fishing-themed vintage tea towels in a row, and both of them "Crying Towels"* at that (those fisherman types must be big sooky-la-la's!) but this is the next t.t. in a teetering pile - if I don't deal with them as I find them, all semblance of order will topple before my eyes and I'll have t.t chaos on my hands! And that could be scary messy. Midge distributors W.A. Pure Cotton. Hand Printed. 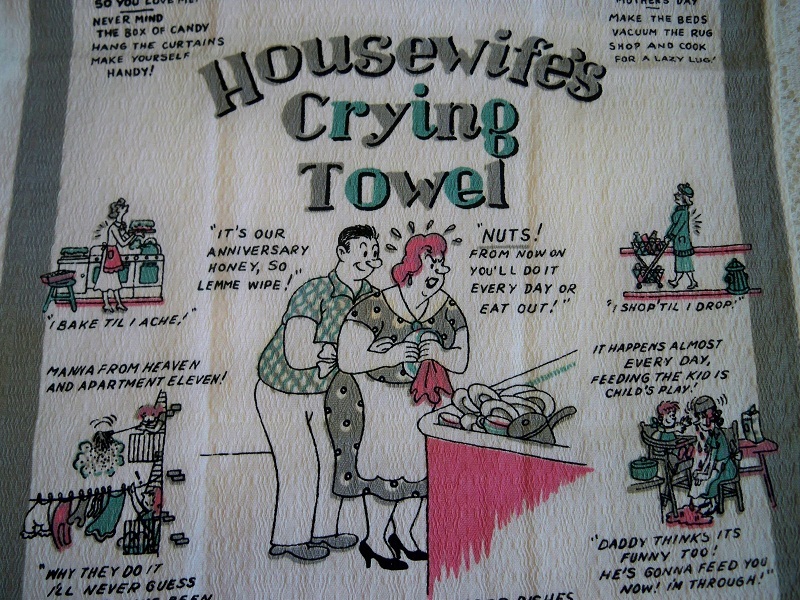 Today's vintage crying tea towel is my favourite of the two (and not just because I love that combo of red, aqua and yellow) it harks back to another era when people actually thought this sort of stuff was funny. Side splitting? No. It does make me smile though, you? Sweetly amusing and reminiscent of simpler times? Absolutely. Here's a link to last week's tea towel in case you missed it first time around, or want another look-see to compare. I'm afraid you'll have to scroll all the way to the end because I plonked it without any fanfare, at the end of my post. i have to agree on your remark about simpler times. i miss them. i must be getting old. A crying teatowel? Never heard of them before. I wonder if it is an Aussie thing? I have been having a bash at printing my own tea towels over the last few days, quite time-consuming and a little frustrating hand printing-i think i need to make my own 'crying when craft projects go wrong' tt! No chance of crying with laughter with these examples, but yes, there is a.sweet innocence about the humour style. My parent's neighbours used to bring metal dinner trays back from their British Isle holidays with some 'hilarious' rhyme on them. These t.t's would be an excellent companion for the trays. I've not heard of a crying towel, that's cool. 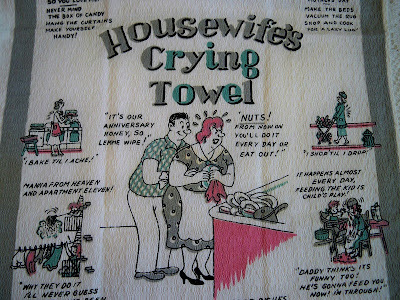 Never heard of crying towels before but they are really good! Prefer the previous one because of the look of the guy's face! The mother in law often gives us hilarious(?) tea towels about Irish sons and Scottish mothers. She thinks we should display them. How? Where?? It seems like I'm the only one yet who knows what a crying towel is. That was a pretty common term when I was a kid. I guess that means Kylie is up on her vintage vocabulary...and I'm just old...I mean, vintage! I agree that the colors in this week's tt are nicer, but I like the angrily crying gentleman saying, "stupid @*!! ** flies." He's a man after my own heart. I like this week's better, and I am another one who has never heard of crying towels! Truly hilarious. So corny they are amusing in a slightly turned-up-mouth way. Can you show us your pile of TTs? Never heard of crying towels. And I sure had not heard of t.t. chaos. It sounds like something we must never let happen! PS - better say I love the towels before I leave (I really do). I was busy laughing.